John is owner of Snagler Tackle and Guide Serivce. Scott is owner of SJ Fishing Adventures. Ken Trail is owner of Rock On Charters. Rod is owner of Koinonia Guide Service. 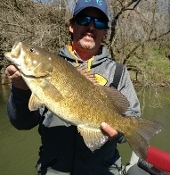 Jeff is owner of Shallow Water Fishing Adventures. Guides on Upper Potomac and Susquehanna Rivers.